"Why should we care about animals when humans continue to be oppressed?" Harlan Weaver, assistant professor of gender, women, and sexuality studies, gave a talk that sought to respond to this question as part of Montana State University's College of Letters & Science Distinguished Speaker Series Oct. 6. 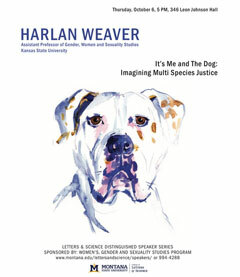 Weaver's presentation, "It's Me and the Dog: Imagining Multi Species Justice," countered the ways that questions such as those noted above position the concerns of marginalized humans as counter to those of animals. Articulating a means of thinking and understanding human and animal needs together through examples such as the Michael Vick case and contemporary controversies in dog training, Weaver demonstrated a form of justice oriented toward both humans and nonhuman animals, a multispecies justice.